In part one of this post (which can be found here), we discussed the influences behind Cardinal Bertone's remarks following Sr. Lucia's funeral Mass, when he made a direct connection between the "signs in heaven" described in the Bible with the events of 9/11. We noted how Sr. Lucia is known to have written a letter to Pope St. John Paul II in the aftermath of the attacks on the World Trade Center. This was soon followed by the dispatch of Archbishop Bertone, the then Secretary of the Congregation of the Doctrine of the Faith, to interview Sr. Lucia in November 2001 - the timing of which seems in all likelihood in direct regard to the letter she had sent the Holy Father. We have also noted previously in the first part of this post how there are several strong indications that the "attachment" to the Third Secret of Fatima (the interpretation of the secret given to Sr. Lucia by Our Lady), contains a precise date concerning the turn of the millennium, and relates to the struggle of the Woman Adorned with the Sun against the Dragon of the Apocalypse. Once we begin to pool this evidence together, it strongly suggests that Cardinal Bertone's contention that the events of 9/11 are connected to the "signs of heaven" described in the Bible, is in fact rooted in some information conveyed to him by the seer of Fatima herself - which was most likely originally communicated to the pope in the immediate wake of the destruction of the Twin Towers. At the time, there were rumours circulated by Inside the Vatican that Sr. Lucia had sent a letter to Pope St. John Paul II immediately after the attacks on the World Trade Center. Citing anonymous sources from within the Carmelite order, traditionalist newspaper The Remnant published yet another rumour that Sr. Lucia had received a new apparition of the Virgin Mary on October 7th, 2001 - the Feast of Our Lady of the Rosary - which rather aptly, also reflects the struggle between the Arab and Christian worlds, since this feast commemorates the Battle of Lepanto in 1571, when Catholic forces triumphed over the Islamic Ottoman fleet. The alleged new revelation was supposedly to ask for prayers to prevent an impending "blood bath", and seems to be partially based on the fact that the Carmel of Coimbra did indeed hold to a 24 hour period of prayer on 7th October, 2001. At least one Carmelite convent had confirmed that it had received a letter from the Association of Our Lady of the Rosary of Fatima, dated to 13th September, 2001 (just two days after 9/11), calling on the Carmelite order to unite with Sr. Lucia in praying for peace in the world on 7th October - the Feast of the Holy Rosary. In recent months, especially after the sad event of the terrorist attack last 11 September, articles on alleged new revelations by Sr Lucia, announcements of letters of warning to the Pope and apocalyptic reinterpretations of the Fatima message have appeared in the Italian and foreign press. The suspicion that the Holy See did not publish the whole text of the third part of the "secret" is being reaffirmed and certain "Fatimist" movements have repeated their accusation that the Holy Father has not yet consecrated Russia to the Immaculate Heart of Mary. 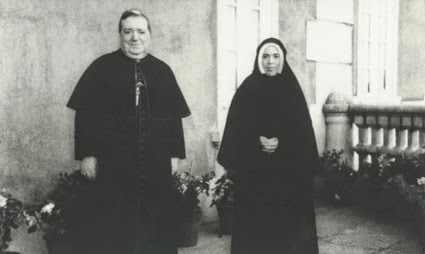 It was therefore considered necessary, with the agreement of Cardinal Joseph Ratzinger and the Bishops of both Leiria-Fatima and Coimbra, that I meet Sr Lucia in the presence of Rev. Luis Kondor, SVD, Vice-Postulator of the cause of Bl. Francisco and Bl. Jacinta, and of the Prioress of the Carmelite Convent of St Teresa, to obtain explanations and information directly from the only surviving visionary. "If I had received new revelations, I would not have communicated them to anyone, but I would have told them directly to the Holy Father..."
So we can safely rule out the possibility that Sr. Lucia received a new private revelation at this time, as was suggested by The Remnant. But there was no denial that she had sent a letter to Pope John Paul II in the wake of the attacks on the World Trade Center. Instead we find a confirmation that if there were any developments concerning the message of Fatima, Sr. Lucia would have communicated this directly to the pope. This suggests that the content of the 2001 letter directly referred to the contents of the Third Secret or the attachment to the Secret kept in the Papal Apartments, and was perhaps a new understanding of this material in light of the world-changing events which had occurred at the turn of the millennium, rather than containing details of any new private revelation. To use the words mentioned by Archbishop Bertone in his press release, the contents of this letter contained "warning to the pope and apocalyptic reinterpretations of the Fatima message". Cardinal Joseph Ratzinger, prefect of the Congregation for the Doctrine of the Faith, said Thursday that the rumors about this alleged letter are the continuation of "an old polemic fed by certain people of dubious credibility," for the purpose of "destabilizing the internal equilibrium of the Roman Curia and of troubling the people of God." Although Cardinal Ratzinger's words were intended to bemoan the fact that these rumours were being exploited by the "Fatimist" movement, it has been noted they do not deny the existence of this letter - but rather add an intriguing insight into the destabilizing effects that these rumours were having on "the internal equilibrium of the Roman Curia". In response to this statement, the "Fatimist" movement pointed out that the very fact that there were internal divisions within the Roman Curia itself on this matter, highlights that there was some considerable substance to these claims. If there were no truth behind these rumours, then they could not possibly cause any internal divisions within the Roman Curia - given that the high ranking members of the Vatican hierarchy are the very people who would be fully appraised of these matters. The fact that the Roman Curia was divided on this issue points to something of considerable weight behind these rumours, and indicates not only that the existence of this letter was widely known within the Vatican hierarchy, but also that its contents (which most likely consisted of an "apocalyptic reinterpretation of the Fatima message" in light of the events of 9/11) proved to be extremely divisive. We can find yet another detail of the content of this letter in Cardinal Bertone's book The Last Secret of Fatima. Here, Bertone informs us that when he met Sr. Lucia for the second time, after the events of 9/11: "...she showed absolutely no interest in drawing connections between Fatima and the attack on the Twin Towers." (The Last Secret of Fatima, p78). While on the surface this would appear to contradict the possibility that this letter contained some sort of apocalyptic reinterpretation of the Secret of Fatima linking it to the attacks on the World Trade Center, it actually provides us with a number of clues. Given that Sr. Lucia had shown no interest in connecting the Secret of Fatima to the events of 9/11, we can safely conclude that it was not her that had brought this topic up during her interview. 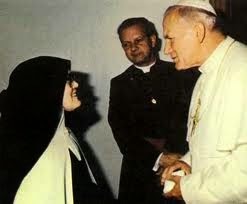 Which can only mean that Cardinal Bertone had questioned her on this subject - asking her if she thought there was a connection between the Secret of Fatima and 9/11. The fact that it was Cardinal Bertone who had raised this connection suggests that he had been considering a possible link between the two himself, most likely due to the contents of the letter she had recently sent Pope St. John Paul II. While this means that there was no explicit link between the events of 9/11 and the Secret of Fatima in this letter, that must have been something within it to suggest such a connection - enough to warrant Cardinal Bertone's question asking if Sr. Lucia thought the two were linked. Sr. Lucia's response to this question - that of disinterest in making this connection herself, seems to be a typical trait of her personality. We know that Sr. Lucia humbly deferred to the Church authorities in matters of interpretation, stating of the Third Secret: "I wrote down what I saw; however it was not for me to interpret it, but for the Pope". ("Conversation with Sister Maria Lucia of Jesus and the Immaculate Heart", The Message of Fatima). Although Sr. Lucia did not answer the question that Cardinal Bertone had put to her, asking her if she thought there was a link between the Secret of Fatima and the events of 9/11, we know that he remained personally convinced that the attacks on the Twin Towers were related to the "signs in heaven" described in the Bible - given the fact that he publicly mulled over this possibility following Sr. Lucia's funeral Mass. This means that although it was not completely explicit, there must have been something contained in this letter which strongly suggested a connection between the Secret of Fatima, 9/11, and the apocalyptic "signs in heaven" described in the Bible - which herald the moment Satan is cast from heaven down to the earth, signaling the rise to power of the Antichrist and the fulfilment of the prophecy of the mark of the Beast. The recently published private revelation, concerning a vision seen by Sr. Lucia which prompted her to commit the Third Secret to writing, helps us to gain a better understanding of the implications behind these events, and what they portend for the future. In order to fully grasp the true significance of this private revelation, we must turn back to examine some material which was published earlier on this blog, and re-evaluate some of our previous conclusions in light of this new evidence. And the angel whom I saw standing on the sea and on the land raised his right hand to heaven and swore by him who lives forever and ever, who created heaven and what is in it, the earth and what is in it, and the sea and what is in it, that there would be no more delay, but that in the days of the trumpet call to be sounded by the seventh angel, the mystery of God would be fulfilled, just as he announced to his servants the prophets. Only this time, the imagery directly corresponds to the ancient descriptions given for the Colossus of Rhodes, which was similarly depicted as standing with one foot on the land and one on the sea, while at the same time holding a flaming torch up in the air. This is but one example of the many instances in which the Book of Revelation uses parallelism incorporating the mythology of different Ancient Near Eastern cultures. In doing so, the Apocalypse aligns such imagery with themes found in the Old Testament, in order to imbue the text with a densely layered, complex structure, which can only be fully understood in light of this broader context. The imagery of the Colossus of Rhodes is in turn the primary inspiration for the Statue of Liberty - which was conceived of by its Masonic designers as a "new Colossus", that would adorn the shores of the United States. This bridging connection between the Apocalypse, the Book of Deuteronomy and the imagery of the Colossus of Rhodes informs us that the Angel of the Seven Thunders described in the Book of Revelation is also the angel with the flaming sword seen by the shepherd children in the Third Secret of Fatima, and parallels events which unfold on earth during the eschatological age. 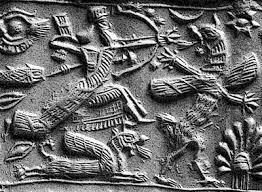 Ninus/Nimrod was also identified with the Mesopotamian deity Ninurta, who similar to Nimrod's description in the Bible as a "mighty hunter", was often depicted with a bow and arrow. Ninurta, shown to the left holding a bow and arrow, standing between a lion and his daughter, the Babylonian goddess Ishtar. According to both Jewish and Christian tradition, it was King Nimrod who constructed the Tower of Babel. 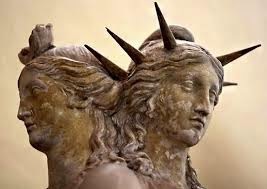 So by evoking the legacy of the Greek goddess Hecate and her Ancient Near Eastern counterparts (such as Isis and Ishtar), the symbolism of the Statue of Liberty not only alludes to the Colossus of Rhodes and the Angel of the Seven Thunders, but is also closely associated with the story of King Nimrod and the construction of the Tower of Babel. In basing the symbolism of this famous statue on the mother-goddess figure of the ancient world, the Freemason architects responsible for its design appear to have deliberately associated it with the Whore of Babylon described in the Apocalypse. The woman was arrayed in purple and scarlet, and adorned with gold and jewels and pearls, holding in her hand a golden cup full of abominations and the impurities of her sexual immorality. And on her forehead was written a name of mystery:“Babylon the great, mother of prostitutes and of earth's abominations.” And I saw the woman, drunk with the blood of the saints, the blood of the martyrs of Jesus. “None of the daughters of Israel shall be a cult prostitute [qedesha], and none of the sons of Israel shall be a cult prostitute [qedesh]. You shall not bring the fee of a prostitute [zonah] or the wages of a dog into the house of the LORD your God in payment for any vow, for both of these are an abomination to the LORD your God." The word qedesha (or kedeshah) is taken from the same Semetic root word (qdsh) used as a title for Asherah. So the alternative name for the goddess Asherah - Qodesh, appears to have been used as a Hebrew word-play for qedesha ("sacred prostitute") in the Apocalypse. So to the Hebrew mind, the "prostitute" or "qedesha" of Babylon, would quickly evoke images of the Canaanite goddess Asherah. 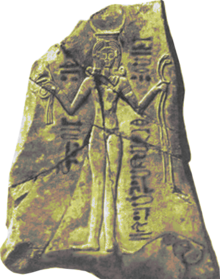 Asherah was adopted into the religion of ancient Egypt as the goddess Qetesh (derived from the Canaanite name Qedesha), and was considered to be the fertility goddess of sexual pleasure. Qetesh was considered by the Egyptians to be a combination of the goddesses Asherah, Astarte and Anat, and like the Greek goddess Hecate (who provides the chief imagery of the Statue of Liberty), is one of the best examples in antiquity of the idea of a "triple goddess". The fact that Qetesh was considered to be a triple goddess, or a deity with an inherent threefold nature, gives this figure a striking association with the Greek goddess Hecate. 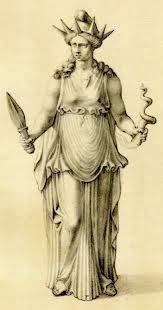 Hecate was the goddess of witchcraft and crossroads, and is the most widely known triple goddess in the ancient world. She was usually depicted in threefold form in ancient art, and cult images of Hecate in triplicate form were often placed at crossroads with three ways, which served to highlight an aspect of this goddess as being a conduit between worlds, wherein she would be invoked to manipulate earthly events through the practice of occult magic. Another remarkable similarity between Qetesh and the Greek goddess Hecate is that both were often depicted holding a snake. 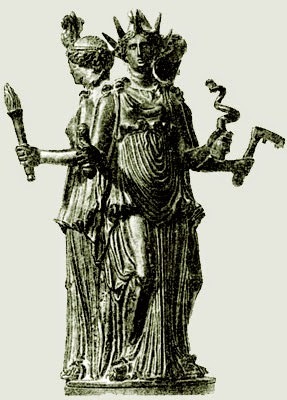 The various connections between the triple goddesses Hecate and Qetesh establish them as being merely different manifestations of the same deity, meaning that the Statue of Liberty is basically a representation of the Mesopotamian goddess Ishtar/Inanna/Astarte - the qedesha or "sacred prostitute" of Babylon, and is partially styled after the Colossus of Rhodes. 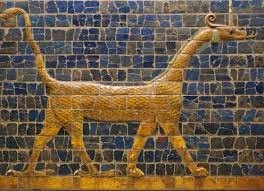 A further link between the Whore of Babylon and the various manifestations of the ancient Babylonian goddess Ishtar can be found in her connection to myth of the destruction of the primordial seven headed water dragon. One of the earliest versions of this myth is found in the story of Ishtar's father - Ninurta. As we have already discussed, Ninurta was associated by ancient historians with the Biblical King Nimrod, and in ancient Mesopotamian mythology, he was tasked with slaying a seven headed serpent associated with the mushussu, (which in a further parallel with the Dragon of the Apocalypse, translates as "reddish snake) - a hybrid between a serpent, lion and bird. The mushussu (previously known by an incorrect transliteration as sirrush) was depicted on the Isthar Gate constructed by King Nebuchadnezzar circa 575BC, which was the main entrance to the ancient city of Babylon. This motif of a legendary hero struggling against a primordial serpent recurs in other legends, such as the Babylonian god Marduk killing Tiamat, the conflict of the Egypt sun god Ra against the serpent Apophis, or Heracles battling against the Lernaean Hydra. In the land of ancient Israel, the most well known version of this story was the Canaanite myth regarding Baal Hadad's victory over the seven headed sea monster Yam/Lotan. In the Canaanite mythology, the mother goddess Asherah offers herself up as a consort to Yam, the god of the sea, in order to placate his wrath against her children. But Baal, being angered by Asherah's suggestion assaults Yam in a fit of rage, and defeats him by crushing his skull with a club. In the Hittite version of this story, Asherah is identified with Ishtar. Then one of the seven angels who had the seven bowls came and said to me, “Come, I will show you the judgment of the great prostitute who is seated on many waters, with whom the kings of the earth have committed sexual immorality, and with the wine of whose sexual immorality the dwellers on earth have become drunk.” And he carried me away in the Spirit into a wilderness, and I saw a woman sitting on a scarlet beast that was full of blasphemous names, and it had seven heads and ten horns. I am the LORD your God, who stirs up the sea so that its waves roar - the LORD of hosts is his name. The sound of a tumult is on the mountains as of a great multitude! The sound of an uproar of kingdoms, of nations gathering together! The LORD of hosts is mustering a host for battle. They come from a distant land, from the end of the heavens, the LORD and the weapons of his indignation, to destroy the whole land. Wail, for the day of the LORD is near; as destruction from the Almighty it will come! Therefore all hands will be feeble, and every human heart will melt. They will be dismayed: pangs and agony will seize them; they will be in anguish like a woman in labor. They will look aghast at one another; their faces will be aflame. Behold, the day of the LORD comes, cruel, with wrath and fierce anger to make the land a desolation and to destroy its sinners from it. For the stars of the heavens and their constellations will not give their light; the sun will be dark at its rising, and the moon will not shed its light. I will punish the world for its evil, and the wicked for their iniquity; I will put an end to the pomp of the arrogant, and lay low the pompous pride of the ruthless. I will make people more rare than fine gold, and mankind than the gold of Ophir. Therefore I will make the heavens tremble, and the earth will be shaken out of its place, at the wrath of the LORD of hosts in the day of his fierce anger. The vision of a "flame-like lance" touching the axis of the earth here, causing a massive earthquake, directly echoes the Book of Isaiah's description of the earth being shaken out of its place (Isa 13:13) and the trembling of the foundation of the world (Isa 24:18). We now know that huge earthquakes can indeed shift the axis of the earth, given that the earth's tilt was slightly shifted during both the Indonesian earthquake of 2004, and the earthquake in Japan in 2011. The fact that this vision is directly connected to the eschatological earthquake, informs us that the subsequent portion of this private revelation is describing the destruction of Babylon foretold in the Apocalypse. So the angel threatening to strike the earth with the flaming sword seen in the Third Secret is directly associated with the eschatological earthquake and chastisement of the world power symbolically referred to as "Babylon". In my book Unveiling the Apocalypse: Prophecy in Catholic Tradition, I forward the hypothesis that the prophecy of the "burning mountain" being thrown into the sea foretells the future lateral collapse of the volcano Cumbre Vieja in the Canary Islands, which some of the world's most prominent geophysicists believe will generate a mega-tsunami that will devastate the east coast of the Americas, as well as parts of Western Europe and North Africa. The United States of America is currently the only dominant world power that fits the portion of the prophecy that describes the Whore of Babylon as the "great city which has dominion over the kings of the earth" (Rev 17:18). The fact that one of the chief symbols of America is embodied by a statue which was styled by its Masonic architects after the pagan goddesses Hecate/Qetesh/Asherah/Ishtar (the mythology of which forms the basis for the Whore of Babylon), can only further affirm this identification. In Unveiling the Apocalypse, I proposed that the eschatological earthquake centred on Israel at the end time would lead to a colossal surge in volcanic activity across the North African tectonic plate. culminating in the eruption of Cumbre Vieja, at La Palma in the Canary Islands. This hypothesis was formed on passage of the Apocalypse which states that God would remember to punish Babylon the great for its sins at the occurrence of the eschatological earthquake (Rev 16:19), and the fact that the Book of Ezekiel prophesied that entire mountains would be thrown down during this colossal seismic event (Ezek 38:20). This can only mean that the geological impact of eschatological earthquake is intimately connected to the "great mountain, burning with fire" being thrown into the sea, both of which are related to the pouring out of the cup of wrath held in the hands of the Whore of Babylon. I further speculated that the results of this volcanic collapse was in some way part of the Secret of Fatima, since Sr. Lucia had specified that its contents were directly related to chapters 8-13 of the Apocalypse, and the judgment of Babylon by the burning mountain being cast into the sea is first mentioned in Rev 8:8. The link to the story of King Nimrod/Ninurta, the Tower of Babel and Ishtar is further compounded when we take into consideration that the events of 9/11 took place so shortly after the 1999 solar eclipse (which I argue was part of the "signs in heaven" referenced by Cardinal Bertone) - the extremely narrow path of totality of which passed directly through the ancient city of Nineveh, in Mosul, Iraq. It seems to be beyond coincidence that this exact location has recently been taken over by an Islamist terrorist organisation bearing the acronym ISIS (the name of the Egyptian equivalent of Ishtar), all as a result of the American led invasion of Iraq in the aftermath of 9/11. This new development appears to be an example of the "ripple-effect" of prophecy, which radiates out through history like recurring fractals, providing further witness to these interconnections. What has been is what will be, and what has been done is what will be done... there is nothing new under the sun. The dramatic account of the writing down and the transmission of this vital Message begins in 1943. The hour of providence had then struck. Sister Lucy was living at that time in the convent of the Dorothean Sisters of Tuy, in Spain. In June, 1943, she suddenly fell gravely ill. Her condition was so alarming that Bishop da Silva, the Bishop of Leiria, became worried. He feared that she would die before having revealed the Third Secret of Our Lady and he sensed that it would be the loss of an exceptional grace for the Church. Canon Galamba, the friend and advisor of the Bishop, then suggested to him an extremely judicious idea, that he at least ask Sister Lucy to write down forthwith, the text of the Third Secret and then that she place it in an envelope sealed with wax, to be opened later. On September 15, 1943, Bishop da Silva went, therefore, to Tuy and he asked Sister Lucy to write down the Secret “if she really wanted to.” But the seer, undoubtedly under the impulse of the Holy Spirit was not content with this vague order. She requested of her Bishop a written order, formal and perfectly clear – that is very important. The final Message of the Virgin of Fatima is, as previously were Her other requests, linked to marvelous promises. It is an exceptional grace offered by God to our 20th Century in order to meet its most urgent needs. But again it is necessary that the pastors of the Church have sufficient faith and docility to the designs of Heaven in order to be instruments of this outpouring of grace that God wants to bestow upon the world through the sweet mediation of His Immaculate Mother. In 1943, God desired that it be the Bishop of Leiria, who demanded of this messenger the writing down of the Third Secret. In mid-October, 1943, Bishop da Silva made up his mind. He wrote to Sister Lucy, giving her the express order that she had besought of him. However, new difficulties would arise. Sister Lucy experienced at that time, for almost three months, a mysterious and terrible anguish. She has related that each time she sat down at her work table and took her pen in order to write down the Secret, she found herself obstructed from doing it. One must, no doubt, see there the last outburst of satan against the messenger of the Immaculate One. Guessing what a terrible weapon this great prophecy could set up against his dominion over souls and his plan to penetrate the very heart of the Church, such a trial endured by the seer thus indicated the magnitude of the grandiose event which was about to be carried out, should the Secret be put down on paper. On Christmas Eve, Sister Lucy confided to her director that she had still been unable to obey the order that she had been given. Finally, on the 2nd of January, 1944, (this is very little known) the Blessed Virgin Mary Herself appeared again to Lucy. She confirmed to her that such was truly the Will of God and gave her the light and the strength to accomplish the writing that had been commanded. The extreme care that Sister Lucy then took to transmit it with complete safety to its recipient, Bishop da Silva, is a new proof of the exceptional importance which she attributes to this document. She did not wish to entrust it to anyone but a Bishop. It was Bishop Ferreira, Archbishop of Gurza, who received from the hands of Sister Lucy, the envelope sealed with wax containing the precious document. He delivered it the same evening to Bishop da Silva. The third part of the "secret" was written by "order of His Excellency the Bishop of Leiria and the Most Holy Mother..." on 3 January 1944. The first thing of note in this text is that we know that the Third Secret was written down on the exact same day as this apparition, since Sr. Lucia dated the bottom of her letter reprinted in The Message of Fatima as follows: "Tuy-3-1-1944". So the imagery of this vision is quite evidently related to the Third Secret itself. Another far more important detail that this text provides us with is that while Sr. Lucia was instructed by the Virgin Mary to write down what Bishop da Silva had ordered her to (the content of the third part of the Secret seen by the three shepherd children on 13th July, 1917), she was also told not to write down the vital meaning of the vision that the Blessed Virgin had revealed to her. This clearly suggests that while the text published in the year 2000 is indeed the complete Third Secret witnessed by the shepherd children in 1917, and that there is no hypothetical "Fourth Secret", Sr. Lucia did not include the meaning of the vision in this particular text. This would imply that Sr. Lucia had written down the interpretation of the vision given by the Blessed Mother in a different text at some later point, confirming the two-text hypothesis of Fatima scholar Solideo Paolini - that the "attachment" to the Third Secret it is not actually part of the Secret itself, but rather an interpretation of the visions contained in the Secret, which if made by Sr. Lucia herself, could theoretically be flawed (since there are considerable difficulties in distinguishing between material that is truly of Divine inspiration from the personal convictions of the seer, as was discussed in Cardinal Ratzinger's theological commentary in The Message of Fatima). It also explains exactly why there were two envelopes bearing content related to the Third Secret - Our Lady herself had instructed to Sr. Lucia to write down the content of the vision seen in 1917, and to keep this separate from the meaning of the Secret that had been revealed to her by the Blessed Virgin. Given that the interpretation of the Secret should of course be considered as a separate entity from the Secret itself, this would explain why the Vatican authorities and Sr. Lucia herself were correct in insisting that the Secret of Fatima has been published in full. When Sr. Lucia was asked by Archbishop Bertone: "Is this the Third Secret, and is this the only text of it?" She replied "Yes, this is the Third Secret, and I never wrote any other'." (Bertone, T, The Last Secret of Fatima, p64). It would seem then that the Third Secret of Fatima has indeed been published in its entirety - it is the interpretation of the visions contained in the three parts of the Secret that is most likely still being withheld, and it is this text which is the content of the envelope kept in a cabinet inside the Papal Apartments, as described by Mgr. Capovilla (which is distinct from the text of the Third Secret that is known to have been kept in the secret archives of the Holy Office). In his recent blog post concerning this new text related to the Third Secret, Antonio Socci informs us that Solideo Paolini wrote to the Carmel of Coimbra in June of this year, asking them if Sr. Lucia ever wrote down the interpretation of the Secret - which this text explicitly informs us that the Virgin Mary revealed to her. Socci tells us that to date, Paolini still has not received a response from the Carmel, which is more or less what was expected, since to admit such would be tantamount to confirming the existence of the proposed "attachment" to the Third Secret, which is the central thesis of the "Fatimist" movement. It would be almost unthinkable that Sr. Lucia would not have been instructed by Our Lady to commit the interpretation of the Secret to writing at some point later, since it is self-evident that this would provide the key to understanding the visions as a whole. 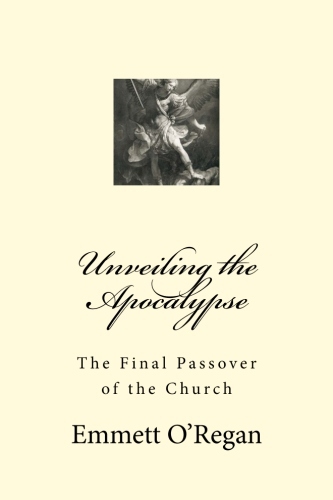 In my book Unveiling the Apocalypse: Prophecy in Catholic Tradition, I argue that the real reason this "attachment" to the Third Secret was not made public alongside the text that was published in the year 2000, was because it contained precise details that related to specific dates in the future - dates which the Vatican would quite understandably be reluctant to confirm in advance. If for example, the interpretation of the Third Secret provided precise details along the lines of: "At the end of this century such and such will happen...", the Vatican would be embracing an almost impossible situation - effectively tying itself to the suggestion that a particular event would occur by an exact date, decades before said event was due to take place. Cardinal Loris Capovilla, who was secretary to St. John XXIII, confirmed that the Holy Father had refused to publish the Third Secret (or its interpretation) by the stipulated date of 1960 because he thought it might not be "entirely supernatural" (i.e. some of its content might be Sr. Lucia's own interpretation), and more importantly that it did not want to risk an "immediate interpretation" (i.e. an interpretation given in 1960) because the text contained "minute precisions" (which most likely pointed to a later date). "Although the Church recognizes the Fatima apparitions She does not desire to take the responsibility of guaranteeing the veracity of the words that the three shepherd children said that the Virgin Mary had addressed to them." This means that the Secret must have contained some specific details about future events, rather than being vague or open to interpretation; and that the Vatican simply could not afford to stake its credibility on guaranteeing in advance that the contents of this prophecy would take place at the prescribed date. How could St. John XXIII have possibly known that the content of the Secret or its interpretation did not refer the years his pontificate, unless it contained reference to a date in the future well outside his expected life-span. As I suggest in my book, and in the earlier post The Third Secret and the Turn of the Millennium, it seems that the date mentioned in the "attachment" is the end of the 20th century, and that the events described in it are directly related to struggle of the Woman Adorned with the Sun against the Devil - which is marked by the appearance of the "signs in heaven", and all of which did indeed take place at the turn of the millennium. This would explain Pope St. John Paul II's apparent fixation with the Great Jubilee Year 2000, which he repeatedly harked to from the very beginning of his career as pope, describing it as "a hermeneutical key of my Pontificate" (Tertio Millennio Adveniente, 23). As I have already noted in the earlier post John Paul II: The Triumph of Mary and the Great Jubilee, in his book The End of Time: Faith and Fear in the Shadow of the Millennium, prominent Catholic journalist Damian Thompson stated that the late Pope's underscoring of the symbolic significance of the turn of the millennium "frequently gives the impression that he knows more than he is letting on" (p172). Writing in 1996 - four years before the publication of the Third Secret, Thompson goes on to suggest that the Pope's level of regard for the turn of the millennium may be attributed to his knowledge of the Third Secret of Fatima (pp173-174). We can find many examples of St. John Paul's apparent obsession with the prophetic importance of the Great Jubilee Year 2000, one of the most striking of which was made during a prayer service the Pope held at the Spanish Steps on 8th Dec, 1983 - the exact same day the Holy Father issued his now famous "apocalyptic" address announcing his intention to carry out the Act of Entrustment of the world to the Immaculate Heart of Mary in an apostolic letter, again mentioning a specific "precision" related to the turn of the millennium:. So it seems apparent then that not only did St. John Paul link the importance of the Great Jubilee Year with the prophecies of Our Lady of Fatima, but also with the struggle of the Woman Adorned with Sun against the Devil foretold in the Apocalypse - which tells us that Satan would be thrown down to earth (Rev 12:9) and transfer his great power and authority to the Beast that rises from the sea (Rev 13:2). An event which would be marked on earth by a series of phenomena that correspond to the "signs in heaven" (an earthquake, solar and lunar eclipses, a meteor shower, a planetary conjunction which recalls the Star of Bethlehem as the "sign of the Son of Man", as well as the appearance of some sort of disastrous spectacle which involves "blood, fire, and columns of smoke" cf. Rev 6:13-14, Matt 24:29-30, Joel 2:28-31). If we despise and reject this last means, Heaven will no longer pardon us, because we will have committed a sin that the Gospel calls a sin against the Holy Spirit. You were asked if the message could be extended, beyond the attack on John Paul II, to other sufferings on the part of the Popes. Is it possible, to your mind, to include in that vision the sufferings of the Church today for the sins involving the sexual abuse of minors? As for the new things which we can find in this message today, there is also the fact that attacks on the Pope and the Church come not only from without, but the sufferings of the Church come precisely from within the Church, from the sin existing within the Church. This too is something that we have always known, but today we are seeing it in a really terrifying way: that the greatest persecution of the Church comes not from her enemies without, but arises from sin within the Church, and that the Church thus has a deep need to relearn penance, to accept purification, to learn forgiveness on the one hand, but also the need for justice. And a great sign appeared in heaven: a woman clothed with the sun, with the moon under her feet, and on her head a crown of twelve stars. She was pregnant and was crying out in birth pains and the agony of giving birth. And another sign appeared in heaven: behold, a great red dragon, with seven heads and ten horns, and on his heads seven diadems. His tail swept down a third of the stars of heaven and cast them to the earth. And the dragon stood before the woman who was about to give birth, so that when she bore her child he might devour it. As Sr. Lucia stated, only one side would be victorious in this War in Heaven - which is a direct reference to the point when Satan would be defeated by the Archangel Michael, and cast down from heaven to the earth, whereupon he begins one last assault against the Church by transferring his great power and authority to the Antichrist. "prophecy must always be interpreted: It is enough to think of the Apocalypse, of the signs in heaven. Have these perhaps not already been seen with the airplanes that toppled the Twin Towers?" It is highly unlikely that Cardinal Bertone would have come to this conclusion by himself. The fact that he made this suggestion in the wake of Sr. Lucia's funeral Mass suggests that the real inspiration for his connection between the signs in heaven and the events of 9/11 was rooted in something communicated to him by the seer of Fatima herself. In this regard, it is of specific interest that on 26th October, 2001, the respected Catholic news publication Inside the Vatican claimed that Sr. Lucia had sent a letter to Pope St. John Paul II almost immediately after the attacks on the Twin Towers had taken place. There was a rumour that this text contained a warning that the pope's life was in danger. When questioned about this correspondence, the then Bishop of Leiria-Fatima, Serafim de Sousa Ferreira e Silva: “did not deny that Sister Lucia had sent a letter to the Pope, but said [drawing a very precise distinction] ‘there are no letters from the seer that express fear for the life of the Pope.’” (See chapter 5 of Christopher Ferrera's book The Secret Still Hidden, which can be found online here). The reception of this letter by Pope St. John Paul II was quickly followed by the dispatch of Archbishop Bertone (then Secretary for the Congregation of the Doctrine of the Faith) to visit Sr. Lucia in the Carmel of Coimbra on 17th November, 2001, who conducted a two-hour interview with the seer in the presence of Rev. Luis Kondor, SVD, Vice-Postulator of the cause of Bl. Francisco and Bl. Jacinta, and the Prioress of the Carmelite Convent of Coimbra. The interesting thing to note here is that Archbishop Bertone had already conducted an interview with Sr. Lucia on 27th April, 2000, just before the publication of the Third Secret, and should have at this stage already acquired everything he needed to know about this text before it was made available to the public. So this follow-up interview was in all likelihood related to a current development, and was made in direct response to the letter Sr. Lucia sent to Pope St. John Paul II in the wake of the attacks on the World Trade Center. And whatever Sr. Lucia told Archbishop Bertone during this subsequent interview appears to have been the primary influence on his remarks following the seer's funeral Mass. “And I will show wonders in the heavens and on the earth, blood and fire and columns of smoke. The sun shall be turned to darkness, and the moon to blood, before the great and awesome day of the LORD comes. And it shall come to pass that everyone who calls on the name of the LORD shall be saved. In the next post, we will look again at how the Angel of the Seven Thunders in the Book of Revelation is related to the angel of the Third Secret, and how this prophecy can be used to identify New York City as the "great city that has dominion over the kings of the earth" described in Rev 17:18 - the city seen by Sr. Lucia being destroyed by a tsunami just before she wrote down the Third Secret. It is this future event which is prefigured in by the "harbinger" of 9/11, which is so closely connected to the "signs in heaven" and the lingering mystery surrounding the Third Secret of Fatima.